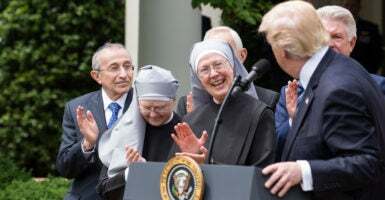 The Trump administration came out strongly in defense of religious freedom Friday, with new legal guidance and a move to reverse one of the most controversial Obamacare mandates. “Every American has a right to believe, worship, and exercise their faith,” Jeff Sessions says. The Justice Department guidelines direct attorneys and agencies that freedom of religious extends to both organizations and individuals, and includes living out one’s religious beliefs. Under the Justice Department guidelines, this could expand to allowing employers to hire in accordance with their religious beliefs and prohibit denying federal contracts to entities based on religious beliefs. The Department of Health and Human Services is rolling back the Obamacare mandate that employers cover contraception and abortion-inducing drugs, creating both a religious and moral exemption. This will expand the number of covered nonprofits and nonpublicly traded for-profit businesses. 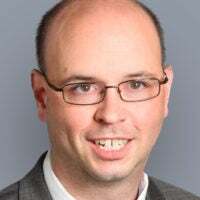 In both cases, the departments are following up on President Donald Trump’s directive that was part of a May 4 executive order on religious freedom. Trump’s executive order directed the attorney general to “issue guidance interpreting religious liberty protections in federal law” in order “to guide all agencies in complying with relevant federal law.” In response, Sessions issued 20 “high-level principles” that federal agencies will follow. The guidelines don’t represent a new policy, but are based on more than 200 existing statutes and 158 existing regulations. These include the 1993 Religious Freedom Restoration Act and the 1964 Civil Rights Act. “The constitutional protection of religious beliefs and the right to exercise those beliefs have served this country well, have made us one of the most tolerant countries in the world, and have also helped make us the freest and most generous,” Sessions said. The Obama administration carried out a “relentless assault on the First Amendment” and promoted “anti-faith policies,” said Tony Perkins, president of the Family Research Council, a social conservative think tank. Under the Obama administration, HHS required employers pay for their employees’ contraception and abortion-inducing drugs, even if this violates the conscience of employers. The Obama administration exempted houses of worship, but religious-affiliated groups that objected still had to allow a third-party administrator handle the contraception coverage. The new policy under Trump offers a separate religious and a moral exemption. The religious exemption would cover a religious-affiliated nonprofit employer, such as a church, school or charity. The moral exemption would be available to employers that have moral opposition to providing contraception or abortion-inducing medication for employees, including a nonpublicly traded company, or a nonprofit even if it doesn’t have a religious affiliation. Already there are 200 entities suing the federal government in 50 difference lawsuits opposing the mandate, according to HHS. However, the liberal group Americans United for Separation of Church and State announced plans to sue the Trump administration over the new HHS rules. The Obama rule was “onerous” and the Trump action has made some progress in changing course, said Melanie Israel, a research associate for The Heritage Foundation, in a statement. Americans will remain free to make their own decisions about, and purchase or find coverage for, the drugs and devices at issue in the mandate, and entities with objections will not be forced to be complicit in choices that would violate their religious or moral convictions. Now that the administration has provided regulatory relief from the mandate, pending cases in courts across the country—including the case brought forward by the Little Sisters of the Poor—should come to a resolution as well. The Becket Fund, which represented Little Sisters of the Poor in its lawsuit against the Obamacare mandate, supported the change.